Painless payments with Zoho and Stripe! Make getting paid faster and easier than ever! Zoho is integrated with Stripe, an online payment gateway that allows you to get payments from your customers effortlessly. Stripe is available in all of these countries. Set up the sync in just two clicks! Already have an account with Stripe? Setting up the sync process with Zoho is just a couple of clicks away! With the Zoho Books integration with Stripe, there's no need for manual account reconciliation anymore. All of your payment information in Stripe is automatically accounted for in the Stripe Clearing account. This is a one-time process, which has most of the fields filled out for you. Simply select Stripe as your payment option when you create an invoice and you'll be good to go. Once paid, the amount is credited into a Stripe Clearing account, with the appropriate transaction fee deducted and recorded to your Bank Charges account. After your customers make their payments, that information gets automatically updated to the bank records. What if I don't have a Stripe account yet? No problem! 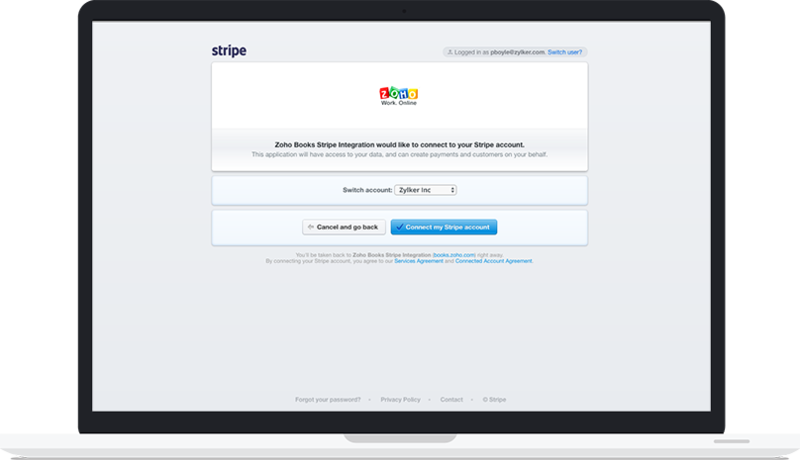 You can always sign up for a Stripe account through this integration. Which countries does Stripe support? Stripe is available in over 25 countries. Check out the list here to see if Stripe is available for you. How do I search for payments made through Stripe? The payments made through Stripe are automatically recorded. You can access the transaction information in a Stripe Clearing account, in the Banking module. Do I need to pay to integrate my Zoho account with Stripe? Good news: Zoho doesn't charge you for establishing this integration. You will only be charged by Stripe for processing transactions. What is Stripe's minimum transaction amount? The minimum amount that can be charged through Stripe is $0.50. In the case of other currencies, the amount should be equivalent to $0.50 after converting it to US dollars. Which currencies does Stripe support? Stripe supports a long list of currencies for making charges and transferring to your associated bank accounts. Check out this link to see which currencies Stripe supports. Get paid faster online today! Try out the Zoho - Stripe integration here!